We've learned that the Keisei system, which allows players to respawn at their exact location upon death, cannot be exploited in Sekiro: Shadows Die Twice but FromSoftware has also revealed one of the bosses that will cause a lot of those deaths. 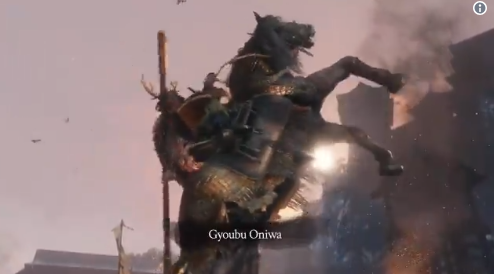 Meet Gyoubu Masataka Oniwa. Revealed on Twitter, this warrior rides a gigantic horse and wears elaborate armor. This is one of the many bosses the player will encounter and as we get close to the game's release we'll likely see more revealed. Sekiro: Shadows Die Twice launches on PS4, Xbox One, and PC later this year on March 22.